If you're a frequent reader of the entries here on WinEveryGame, you may have noticed that most of them start off with a light introductory paragraph. Besides trying to make you chuckle (or perhaps groan) and providing you with interesting factoids, these little paragraphs are meant to give you a bit of a clue about a word's meaning before we jump into a full-blown explanation. By conjuring an image of a word's essence in your head, our intros are meant to serve as harbingers for the information to come. It may be impossible to predict the future, but having a harbinger can help you figure out what to expect! A harbinger is something that serves as an indication of an event that's soon to happen. Such a sign might be nothing more than a subtle hint - maybe the faint smell of ozone before a thunderstorm - or it might be frustratingly cryptic, like a nebulous prediction from a fortuneteller that you can only make sense of after the fact. Of course, a harbinger can just as easily be blatant and detailed about the things it foretells, as you know if you've ever seen a preview for an upcoming Marvel movie. While the term often refers to a perceptual signal like a symbolic vision or sound, a harbinger can just as easily be a person, object, groundhog, pre-visit phone call, pencil sharpener, weird smile on the face of a teacher whenever he's gearing up to give a pop quiz - anything, really, that hints at or explains the future. Harbinger can also sometimes be used as a verb to describe the act of revealing upcoming circumstances. A second, slightly different usage of harbinger describes an early version of an object. Rather than being a representation of something to come, this type of harbinger is a forerunner, a precursor of something that hasn't reached its final form. This type of antecedent might directly evolve into a future object - for instance, you could say that a caterpillar is the harbinger of a butterfly - or it might just be something that plays a role in its development, like the blues were to modern rock music. Often, it is difficult to distinguish an object as a harbinger of something else until the future actually comes to pass! Example: Back in October, Wally had planted the bulbs that he hoped were harbingers to beautiful flowers. 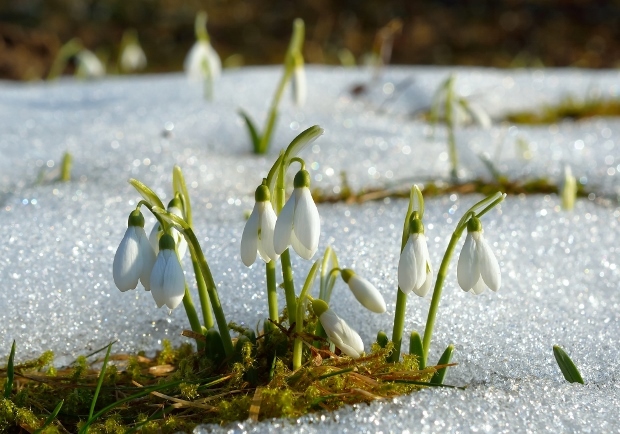 Example: After a long Winter, Wally was thrilled to see the new shoots poking through the snow that he considered to be harbingers of Spring. Example: The neighbors shook their heads as they watched the young man race down the street, shouting to harbinger the coming of warm weather. Interestingly, the earliest ancestor of harbinger is thought to be the Germanic phrase harja-bergaz, which meant "shelter" or "inn." This gives context to the earliest usage of harbinger in English, which, dating back to the late 1400s, referred to an individual sent ahead by a large traveling group (often a military unit) to announce its coming and to secure lodging for the others. Although that meaning has largely fallen out of use (we rarely need to house travelling armies these days), these harbingers did indeed announce the future by giving notice of their groups' approach. The definition referring to a more general object which precedes and foretells of another's appearance is first recorded around the mid-16th century, with the verb form popping up around the same time. Harbingers: The present tense form of harbinger is used when a singular, third-person subject brings news of what's ahead. Example: The smoke seeping from the hood of your car harbingers a trip to the mechanic's. Example: A chronically overexcited young man, Wally harbingers something new at the top of his voice several times a week. Harbingering: This form is used to describe when someone or something is currently giving insight to the future. Example: The crazy young man running down the street claims he is harbingering a new season. Harbingered: This is the preterit form of the verb harbinger. Example: Given how frequently he harbingered upcoming events, Wally was bound to be right at least some of the time. A shadow swung slowly across the ground beside him, and looking up, the ape-man saw Ska, the vulture, wheeling a wide circle above him. The grim and persistent harbinger of evil aroused the man to renewed determination. Here, the detestable vulture, Ska, is considered a harbinger of death and wickedness, likely because he only circles above those he believes will soon die. Luckily, the indefatigable Tarzan refuses to let this announcer of death get to him. Bring out the linguist in you! What is your own interpretation of harbinger. Did you use harbinger in a game? Provide an example sentence or a literary quote.